If you require an efficient, environmentally friendly and programmable form of heating, which can heat your house for several days at a time, from one filling, then a pellet stove is for you. Pellet stoves can be either a simple room heater or a very sophisticated boiler unit. They burn compressed wood pellets, made from agricultural or forest waste and operate by slowly feeding fuel automatically from a hopper/storage container into a burn tray. A constant flame is created and monitored to ensure maximum efficiency with low power consumption. Pellet stoves are fully programmable, much like a traditional gas or oil boiler, using thermostats and time control systems. They also typically incorporate an electronic ignition and some even have their own back-up power supply, in the event of a mains failure. 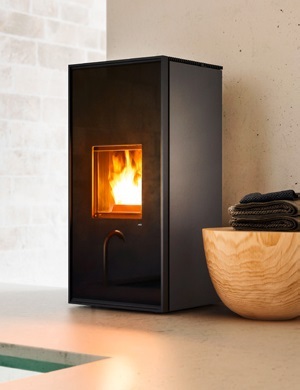 Pellet stoves are very quite and they come in a variety of sizes, styles and colours. They are very easy to use, via a user-friendly control panel. When it comes to de-ashing, again this is very simple and usually does not need to be carried out for many weeks.